When Cameron first seized power the conservative government oversaw a level of civil unrest (namely the London riots) that hadn’t been seen since the 1980s. In the succeeding four years they proceeded to widen the gap between rich and poor; demonise and isolate ethnic minorities; violate privacy legislation set out by the EU, and spew a campaign of propaganda that not only crippled the Scottish independence movement but also saw the Torries get re-elected! The cunning manipulation of the people would be impressive were it not so damaging for the majority. More recently the government’s scramble towards totalitarianism has taken an even more sinister turn. He has employed Putinesque threats to force the EU into giving into his demands and has set about scrapping the EU’s human rights bill. Is there ever a justification for scrapping a human rights bill? It is – by is very nature – intended to promote a free and fair society. He has also been ardently destroying the National Health Service (NHS); anyone who needs help from the welfare state (which was established due to corporate greed and the state’s responsibility to care for their people), and is ensuring anyone without family wealth will be crippled by debt if they desire an education. How could an elected – not a dictator – politician cause such a level of harm to the people who elected him? I classify the times I lived in Russia as the time I told people that Putin would become their dictator and the time that I was afraid to, as he had already succeeded. There were only a few years between those stages in Russian politics. I feel like I am living in England’s equivalent to the former and hope that this country never reaches the latter stage. 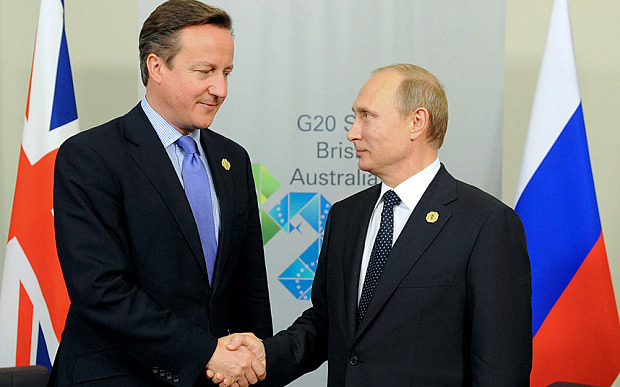 It’s perhaps unfair to paint Cameron with the same brush as Putin however both take an aggressive stance on foreign politics, support the rich and their conservative base at the expense of the majority, and ensure their boots are firmly on the necks of the poor and marginalised. It waits to be seen where Cameron’s politics take England but the road ahead does not seem bright.